Liverpool saw their lead over Man City at the top of the Premier League table reigned in to just three points after managing an underwhelming draw against West Ham at the London Stadium on Monday night. With City winning at home to Arsenal at the weekend, the pressure was on the Reds to match that result in east London. Manuel Pellegrini’s side started well and defended deep but it was the visitors who would score the opening goal on 22 minutes, with Sadio Mané turning and firing home from inside the box. The goal came after some fancy footwork saw Adam Lallana set up (a very offside) James Milner, who in turn laid one on for Mané. Just six minutes later, the Hammers got the equaliser their positive play deserved, when Michail Antonio netted via a clever Felipe Anderson free-kick. Declan Rice, the hosts’ best player on the night, failed to make the most of a good chance before the break. In the second-half, Liverpool toiled only to see an uncharacteristically high number of their passes going astray. The game would end 1-1, with the hosts arguably unlucky not to pinch a win against the league leaders. 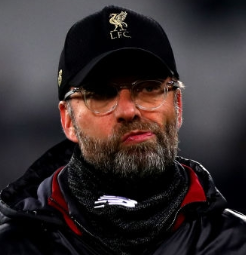 Jurgen Klopp was not best pleased in the aftermath and decided that, rather than the length of the grass, etc, it was poor officiating that had cost his side the win. In 50-50 situations it was always a free-kick for the other team, which was hard and did not make life easy. As a human being, if I know I have made a big mistake (Liverpool’s offside opener) in the first half, I don’t want to open the gap any more. Referees are obviously human beings, and I understand that, but I didn’t during the game because I had no clue that our goal was offside. Pellegrini also stirred the pot, citing a goal scored by Klopp’s Dortmund team against his Malaga side SIX YEARS ago. That’s one heck of a grudge to still be bearing after all these years. Terrific nit-pickery from the boy Pellegrino. Anyway, back to the matter at hand. Man City now play Everton on Wednesday and a win would put Pep Guardiola’s side ahead of Liverpool on goal difference, at least until the weekend. As for West Ham, they stay 12th in the table after a fine display which bodes well for the future.